Two days of hard work from the basket of a cherry picker resulted in the removal of the windmill’s sails on 13th February. Neil Medcalf and Steve Boulton of Traditional Millwrights Ltd laboured in cold conditions to extract the fixing bolts and wedges that held the sails in place. More info below video box. The first task was to rotate the sails and their supporting windshaft, which had not turned for several years, through 180 degrees to bring the uppermost sail to the bottom. This one would be removed first. On the morning of 13th February, a mobile crane arrived at the site and was positioned at the head of the track from Mill Lane. Its long jib was extended high above the mill and from it the lifting hook was lowered into position for the removal of the striking rod. The rod is part of the operating gear for the sail shutters and, before the sails could be removed, it had to be slid forwards out of its working position at the centre of the cast-iron windshaft. With the rod and four-armed ‘spider’ coupling safely at ground level, the lowest sail frame could be removed. This was a fairly straightforward procedure, achieved by extracting each of the four fixing bolts with the weight of the sail hanging from the crane hook. Once safely at ground level, the condition of the timber could be examined at close quarters. Large areas of rot could be seen at most of the major joints of the sail frame. The effects of the driving wind and rain had caused the timber to begin breaking up. Its removal was timely, as it is unlikely that the sail would have survived many more winters without totally disintegrating, and possibly ending up in a neighbour’s garden! The next lift was more ambitious, as the millwrights planned to remove the second sail and its supporting stock in one go. This involved positioning the crane hook above the centre point of the sails and attaching it at the correct point of balance to achieve the lift. When everything was ready, the wooden wedges that held the stock in position were knocked out. With no wedges in place, the stock should theoretically be free to move in the canister – the open-ended box casting at the front of the windshaft. It was found that the stock had absorbed some rainwater over the years since it was fitted, and this had caused the timber to swell slightly near its centre point. With the crane jib applying tension the stock would only move upwards a few millimetres, despite strategic rocking backwards and forwards with the aid of ropes to try and release it. Its increased thickness meant that the stock could not pass through the canister until the millwrights had removed the excess timber with the aid of a power planer and an extra-long chisel. With the swollen area removed, the crane jib applied tension again. The lifting cable hauled the hook upwards until the stock and sail had been lifted clear of the mill and could be lowered to ground level. The final part of the operation was to load the sails onto the trailer of a waiting flatbed lorry for transportation to the millwrights’ yard in Lincolnshire. This was easily achieved with the aid of the lorry’s remote-controlled lifting arm which carefully avoided an inconveniently-placed lamp post! The millwrights expect to complete the next stage of the project, the removal of the cap and fantail, before Easter. 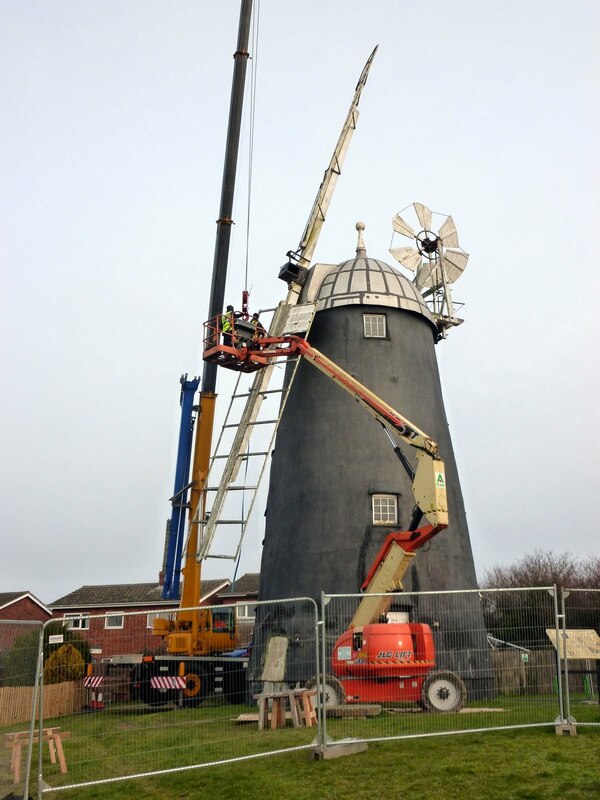 After the weather delayed work for a few weeks, Wednesday morning saw the mill sails being taken down. They have now been taken to the millwright's workshop in Lincolnshire for repair. Photos and a video of the removal of the sails will be published very soon on this Blog and on our website www.burwellmuseum.org.uk . The mill cap will be taken down on Wednesday 13th March (weather permitting!). Please come along, bring your family and friends, and watch this historic event! A mobile crane will carry out the lifting operation with its extending boom positioned high above the Mill. Removing the sails and their supporting stock – rather like de-threading an enormous needle – will take a couple of hours. Hope to see you there on the day!